Is there a recipe for CLIL? Much has been written on what CLIL is and why to do it but there is very little practical guidance on how to plan and teach CLIL lessons. If you are a subject teacher who has been asked to teach in English or a language teacher who has been asked to help teach content, you are probably looking for the best way to do it. In our opinion, CLIL is not only about finding the perfect recipe but rather an adventurous journey that you can embark on – but not without some essential guidelines. There are some things you should definitely keep in mind when you start planning a CLIL lesson. First of all, think about who your students are – their level of English (or whatever the second language is), their previous knowledge of the content you are going to teach them, and what they expect from the class. Once you know that, you can start to outline the programme you want to follow, matching your students’ language level to the content and selecting the materials to use. Here are two examples to underline the impact the language level of your students could have on your course. During a CLIL course, we ran in Italy in a secondary school, we were teaching students that had quite a high level of English. This allowed us to focus more on the content side (in that case Arts and Science) and the English language was just the means we used to deliver the classes. With these students, we were able to adapt material designed for native English pupils. Then we had another experience in a school where the students’ English level was quite weak. This forced us to choose a more language-oriented approach, focusing on the particular vocabulary related to the content areas (in this case PE and Music). With these pupils, native English textbooks were linguistically too hard, so we adapted and created our own materials a) to teach key concepts and vocabulary regarding PE and Music and b) to develop their language skills, with the goal of allowing them to be able to use real English content textbooks by their last year of school. lesson. First of all, think about who your students are – their level of English (or whatever the second language is), their previous knowledge of the content you are going to teach them, and what they expect from the class. Once you know that, you can start to outline the programme you want to follow, matching your students’ language level to the content and selecting the materials to use. Here are two examples to underline the impact the language level of your students could have on your course. 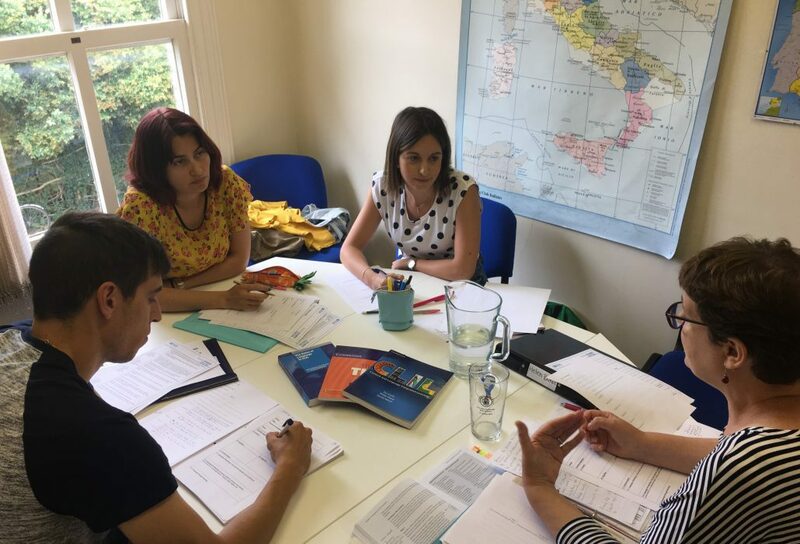 During a CLIL course, we ran in Italy in a secondary school, we were teaching students that had quite a high level of English. This allowed us to focus more on the content side (in that case Arts and Science) and the English language was just the means we used to deliver the classes. With these students, we were able to adapt material designed for native English pupils. Then we had another experience in a school where the students’ English level was quite weak. This forced us to choose a more language-oriented approach, focusing on the particular vocabulary related to the content areas (in this case PE and Music). With these pupils, native English textbooks were linguistically too hard, so we adapted and created our own materials a) to teach key concepts and vocabulary regarding PE and Music and b) to develop their language skills, with the goal of allowing them to be able to use real English content textbooks by their last year of school. An important factor to consider when selecting materials is to avoid overloading students with too much information that they will not be able to process. This can be done by choosing a relatively simple content area or by using an area that you have already covered in L1 and doing the CLIL course as revision and extension. Teachers could find useful to work on English textbooks designed for native English primary schools. This has advantages for both teacher and students: these books’ content level is not too hard but provides an authentic context for the vocabulary that the students will need later on. As for the teachers, they can use the ready-made exercises to test content knowledge, while focusing on the development of further activities to consolidate the second language skills of their students. The internet has a lot of resources for teachers: for example, the British Council and publishers like Pearson offer free content online. You can also have a look at a sample of a CLIL lesson about Induism here. You will also find further ideas on this page. It’s very important for language teachers and content teachers to be working together as a team. Sharing ideas and observing each other’s lessons would really boost your CLIL skills. For example, content teachers have a huge amount of materials which you may be able to find equivalents of in English, and language teachers probably have ideas as to how to exploit those materials for language purposes. Vocabulary is definitely one of the first aspects to consider – is there any technical or specialised vocabulary that your students need to know for the course, or to understand the text? If that is the case, make sure to explain it beforehand by getting students to match words to definitions or pictures, through gap-fill exercises or helping them to guess the meaning from context. Practical ideas: your lesson will probably focus on the general comprehension of one main text – make it more interesting by using comprehension activities such as information gaps, jigsaw reading tasks and jumble tasks. Follow-up activities can work on reinforcing the vocabulary taught earlier and developing both language skills and comprehension of the topic. These activities can include group discussions, individual presentations, making posters and writing about the topic.